Douglas C-54/R5D Skymaster and DC-4 The Douglas C-54 Skymaster, a direct adaptation of the civilian DC-4 while still on the production line, became the outstanding long-range four-engined transport aircraft of the Second World War. With its origins as a civilian airliner, it served chiefly on the long-distance haul of Air Transport Command of the United States Army Air Forces on the Atlantic and Pacific routes, where it cut flight hours between the United States and the theatres of operation thousands of miles away. The reliability of its airframe and engines was put to good use also on the India-China 'Hump' route, which was described as the most arduous of all within the responsibility of Air Transport Command. Like its smaller Douglas stable mate the C-47, the C-54 boasted legendary reliability, and was the preferred long-range transport from among its contemporaries. A special VIP version was built for use by the President of the United States, Franklin D Roosevelt. The Royal Air Force also used it in small numbers during the Second World War, one of which was outfitted as a VIP aircraft for use by Prime Minister Winston Churchill. The U.S. Navy acquired it under the designation R5D. All production having been commandeered by the USAAF on the outbreak of war, no civilian DC-4s flew during the war. After 1945, however, hundreds became available for use by civilian airlines, which converted them into airliners with passenger seating and comfort, or used them as freighters. Douglas re-opened its production line for new builds in 1946, but the cheap price of the second-hand market kept back this production to only 79 examples. Also in 1946 Canadair ventured to build a Rolls-Royce Merlin-powered version, which it named North Star, used by both military and commercial operators. The DC-4 was a common sight in the immediate post-war period up to the 1950s flown by leading European and United States airline liveries, until it started to be replaced by Douglas's own DC-6 and DC-7. The aircraft came in handy during the 1948-49 Berlin Airlift, during which it hauled food supplies and even coal to the beleaguered German city, and again during the Korean War, airlifting the wounded to Japan and the United States. Dozens of variants of the C-54 were employed in a wide variety of non-combat roles such as air-sea rescue, scientific and military research and missile tracking and recovery. 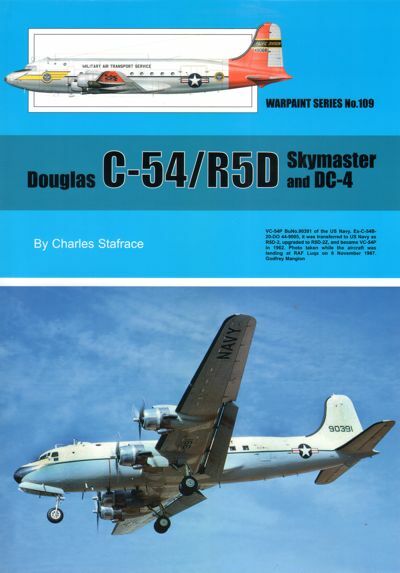 No fewer than 1,315 examples of Skymasters were built in the United States and Canada, flown by 35 air arms of other countries in a variety of versions and roles, and full information on serials, versions and other remarks are all included in very detailed tables in this book. The Aviation Traders Carvair cross-Channel car ferry is not forgotten in this account, and a chapter is dedicated to this unique aircraft converted in Britain from standard C-54s. This new 96 page Warpaint publication written by Charles Stafrace contains 200 colour and B&W photos plus eleven pages of colour artwork by Richard Caruana.